Blocks of rooms at various locations near the Congress site in Kingston have been reserved for the duration of the congress, and special CAP Congress rates apply. For specifics, please see the following table for more information. Prices are indicated in CAN$, before all applicable taxes. **Please note that the Queens University Convocation will be occurring during the same time as our Congress. 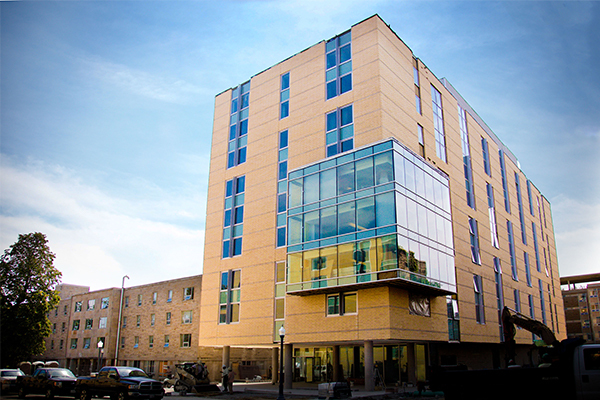 As such rooms, both on-campus and off-campus, will be in high demand. You can cancel your on-site reservations up to 24hrs prior to your planned arrival and we recommend that you make your reservations BEFORE the block bookings are released (see release dates within location descriptions). 8-12 minute walk to the Congress site (750m). 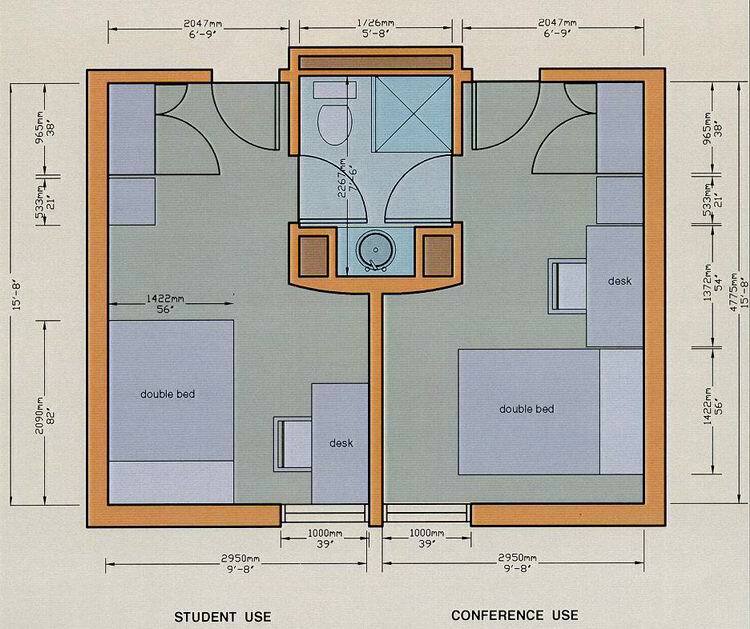 Each suite comprises 2 separated bedroom units that share a private washroom. 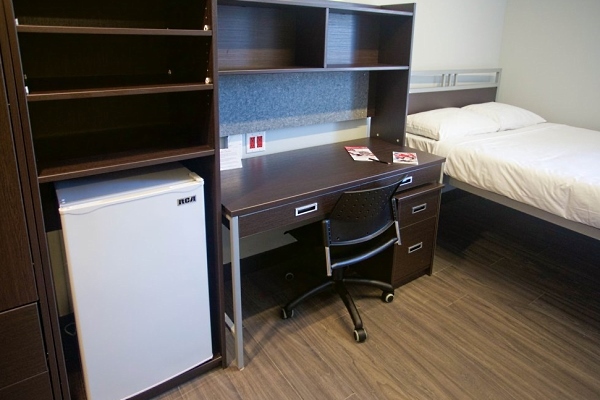 Each bedroom has one extra-long double bed, desk & chair, wardrobe, mini-fridge, and flat screen television. Bedrooms are in air-conditioned buildings. Every other day housekeeping service. Rooms include duvet and bed linens, towels, pillows, and soap. Complimentary wireless internet access in guestrooms and common areas. Lounges on each floor feature kitchen facilities equipped with microwave, stove top and fridge (kitchenware is not included), televisions and social seating areas. Laundry facilities and vending machine available, with laundry cards available for purchase at your check in desk. Parking is on a first-come, first-served basis and can be purchased at reception upon check-in ($14/day). Breakfast ($9) will be available at an adjacent dining hall and purchased during through Conference Registration. CAP Congress rate from May 28 to June 2, 2017. Rooms held for Congress attendees until May 1, 2017. 10-15 minute walk to the Congress site (1.1 km). Each suite includes SmartDesk & chair, mini-fridge, flat screen television, and coffee. Congress rate from May 27 to June 1, 2017. Parking available at $18.00/day. Wireless internet available. Cut-off date: April 27, 2017, subject to availability. 10-15 minute walk to the Congress site (1.0 km). Each suite includes ergonomic desk space, flat screen television, and coffee. Heated indoor pool and sauna. Parking available at $16.00/day. Wireless internet available. 11-14 minute walk to the Congress site (1.0 km). Each suite includes workspace, fully equipped kitchen and dining area, flat screen television, and coffee. Includes a deluxe hot buffet breakfast.